Today Nintendo took to the stage and commenced their E3 presentation, where they provided further details on games we already knew about, confirmed the release for Hyrule Warriors Legends for the 3DS, but gave no date other than a 2016 release. It was also the day they announced new games, Mario & Luigi: Paper Jam, Metroid Prime Federation Force and a new title for the Zelda series, which isn’t for the Wii U. That’s right folks, coming fall 2015 (this very year), is a Four Swords successor (and theorised “remake”), the Legend of Zelda: TriForce Heroes, so let’s talk about what we know about the game so far. It wasn’t just discussed, but demonstrated via video, showing footage of the three Links (sorry Violet, looks like you didn’t make the cut), working together, as the initial player, can play with two friends, questing through the game, solving puzzles and more. 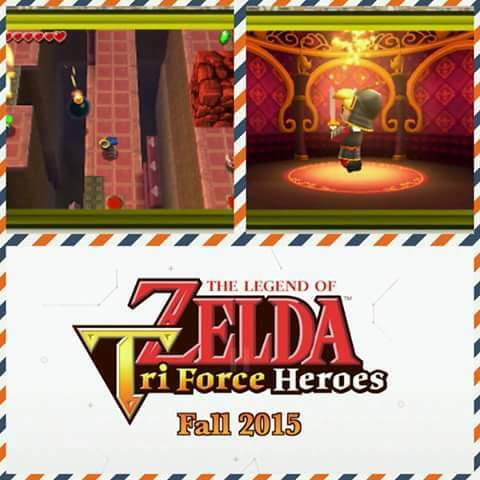 Aonuma admitted the 3D visuals of ALBW heavily influenced the design of TriForce Warriors and that the game features totem mechanics. As for actual plot, well right now as far as that is concerned, it looks to be the plot is as thin as this; Princess Zelda is cursed…with bad fashion and the three Links have to save her, but then again the Zelda series is known for dynamics like this and were well received and loved for them, it’s all part of the colourful, fun appeal the series has always had, even in its darker games, because the makers of Zelda are not one for discrimination, there is a Zelda game for everyone and this game is proof of that, a multiplayer game and quest to share with our nearest and dearest. Still with all this to mind, I still fear a dark cloud looms over us all, a dark shadow covering our Hyrule. With Nintendo adamant on not releasing any Zelda Wii U info, this Zelda news was warmly appreciated and sparked a lot of excitement and enthusiasm in gamers world-wide, but as jubilant as I want to be, I can’t help but think of this news as the final nail in the coffin that is original Zelda titles & stories, exclusive to hand-held, is indeed dead, or just very close to it. Don’t get me wrong, A Link Between Worlds was a great game, a good sequel, just like I’m sure TriForce Heroes will be, but fundamentally, at the end of the day, it was a remake, made as a continuation just like this one is and these aren’t the only remakes to grace hand-held. Ocarina of Time, Majora’s Mask, and of course Wind Waker on home console. Since the release of Spirit Tracks, Nintendo has not released an original, stand-alone Zelda story for handhelds, which could probably be down to the fact the game wasn’t as well received as they expected to be, something that has put them a little on edge, worried as to how their next original title would have us react, so instead they give us a re-mastered Ocarina of Time, quite possible the greatest Zelda game to date and Majora’s Mask and Wind Waker, which for me was the icing on the cake as I was unable to play it the first time round on the Gamecube and added to the justification of getting my WII U. Now Nintendo being afraid, is perfectly plausible and the news of TriForce Heroes, could very well be construed as confirmation as this fact, but fearful or not, this is Nintendo we are talking about, the company that brought us the Zelda series and I wouldn’t put anything past them. If anything, they like us are still just learning what the 3DS is truly capable of and all these remakes, are a clever way of figuring out what they can and can’t get away with, before within the next five years, they will announce and release a new original Zelda story that will just blow us away, much like Zelda Wii U, which until Zelda U’s release, expectations are just going to continue soaring. Already so many theories are floating about the internet as we are all away with the fairies, wondering just what kind of adventure we will all be embarking on, which for Nintendo is a risky move, because after all this time with near to nothing information, all we have right now is hype and this game, this ultimate Zelda title, it will either be a disappointment to a lot of us, or be the Zelda game that changes everything for us. Either way it’s a bit risk, but we like big risks. And let’s not deny, big risks are Nintendo’s thing and as far as Zelda is concerned, dark and depressing, or colourful and cheerful, it really doesn’t matter to us, because it is a series of character, stories and adventure we just love, and we welcome every new addition Nintendo could throw at us because Zelda isn’t just a game, or a series of games, it’s a lifetime, of gaming, of lasting memories and a foundation of friendships. We’ll still be playing it as they pry the gaming devices out of our hands and put us into the earth and it is on that note, I’ll bid you farewell, Wind Waker calls me.